The label I, Voidhanger gave us the honourful opportunity to load down a handful of recordings that were officially released on October 16th of the long-forgotten year 2012. I do have the honour to listen to this stuff and, despite two boxes filled with new material still waiting to be reviewed, I’ll try to write down my subjective yet, of course, intensively professional and thrilling opinion ‘bout them as soon as possible. I’ll start with this one: the mini-album (21:13) Dark Circles by Cincinnati, Ohio-based project The Wakedead Gathering, a one-man army by Andrew Lampe. This release might be considered some foretaste to the upcoming full length (title? ), or the re-release of the limited, somewhat unfinished 2010-debut Tenements Of Ephemera. Personally I am very sad for not having had the opportunity to listen to that debut album (yet), but what I’m experiencing right now with this mini-album is truly orgiastic! 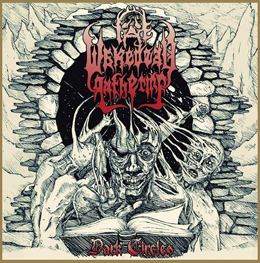 No, seriously, this sounds promising, so I do really look forward to listen to the upcoming full length (and if possible, the re-release of The Wakedead Gathering’s debut studio work)!